Dard Hunter (1883–1966) was a world-renowned authority and practitioner on paper-making, printing, and bookmaking utilizing the tools and techniques of the seventeenth century. Hunter grew up in Ohio and spent a considerable amount of his life there as well as professional schooling in Japan, Italy, and Austria. He operated a paper mill in Lime Rock, Connecticut and his ‘Mountain house’ property for printing and paper-making in Chillicothe, Ohio. While working at the Mountain house, he authored some twenty books on paper-making and produced eight ‘handmade’ books. Hunter did not produce any miniature books, however, he certainly influenced several miniature bookmakers. There is an excellent resource for Dard Hunter information available at www.dardhunter.com for additional biographical information along with the offerings of the Dard Hunter Studios. Dard was very precise and disciplined about using only ‘old school tools and techniques’ for his work. From the studio website, I learned that in 1912, Dard and Edith (his wife) moved to Marlborough, New York and purchased a historic house built in 1714, by Louis Moses Gomez At this time, there was no handmade paper being produced in America. Artists and printers had to rely on imported European paper for their needs. It was Hunter’s goal to change this. Hunter had built a 16’ x 14’ paper mill on Jew’s Creek, across the road from the main house. The mill was fashioned after a 17th century Devonshire cottage, complete with a thatched roof made from rye that he grew himself. Not wanting to compromise his goal to manufacture paper using 17th century techniques, he relied entirely upon a water wheel to provide power to the mill. James Lamar Weygand, of Nappanee, Indiana produced 24 excellent and highly sought after collectable miniature books. Weygand, like Hunter, produced all his own books including the handmade paper, printing, and binding. However, Dard did go one-step further and cut his own type for some of his works. Robert Massmann, of New Britain, Connecticut, REM press, produced a series of six miniatures, all equally collectable titles, about different Hunter subject considerations. One miniature in particular, Dard Hunter: Miscellaneous Thoughts and Reflections, (1984) was done to house two tomes in a small paper model of the Hunter paper mill, which was located in Lime Rock, Connecticut. The actual titles of the Weygand and Massmann miniatures can be obtained from the reference book, 20th Century U.S. Miniature Books, by Robert C. Bradbury, ‘The Microbibliophile’, 2000. Dard Hunter Sr. wrote and published 20 books all related to the subject of paper-making, from his printing press at his Mountain House Press. Eight of those books were printed by hand. Dard Hunter II published an interesting set of miniatures using several of his father’s writings under the press imprint of Mountain House Press, in Chillicothe, Ohio. Dard Hunter designed and printed one full size copy of each of the first three titles represented in the miniature set, each with a special title page drawn by him using pen and ink. The original full size volumes were then photographically reduced, to create the miniature set. The forth volume is a collection of paper specimens of paper that was made at the Lime Rock, Connecticut mill. According to notes by Dard Hunter II, in the miniature set, the specimens are most likely the last paper batches created at the mill. The title of the four-volume set is The Making of Books. It includes the following volumes; The Lost Art of Making Books, Ancient Paper Making, Seventeenth Century Type-Making, and the fourth volume is The Specimens. The size of each volume is 17/8" x 15/16", bound in gilt light brown leather by Gary Parrot, and presented in a gilt leather slipcase. Each volume has a frontispiece as well. There were 50 sets included in the press run. Hunter goes on to explain “the man who produces consistent books in the future must be type founder, and paper maker, as well as a printer.” Hunter certainly set the bar very high for himself, as he wanted to be sure that as the man who created the book, he was totally connected with his work and the final product. There are only six text pages but they certainly help to define the man and how he thought was the best way to produce books. The Colophon provides the information on the binder, date produced, origin of the paper, (the Lime Rock Mill), and the Dard Hunter printer’s mark. Volume II, Ancient Paper-Making, carries a frontispiece of the Marborough Mill, in the winter, showing the waterwheel and mill covered in snow. AS before the text is a reprint of an article that was written by Hunter in 1915 and published in The Miscellany , Volume II, Number 4. Dard Hunter II describes this work as his father’s treatise on his chosen field, and for that reason chose it as the subject of this volume. The senior Hunter provides a short synopsis of his experiences in the world of hand-made paper-making and explains that a portion of what is described as ‘hand-made’ paper may not be exactly as described. Only through close examination is it possible to confirm the processes used to create hand-made paper. The text for this volume is printed on 18 pages with some of the text printed on deckle edge sheets of paper. Deckle edges are paper edges that are ‘untrimmed’ and created when the paper is formed from the slurry left on the screen against the frame’s edges during the process. Once more, the printed information in this volume speaks to the professionalism and discipline that Hunter established for his working relationship between the papermaker, the printer, the author, and the binder. There is no Colophon in this volume but the last page does carry the Dard Hunter printer’s mark. Volume III, Seventeenth Century Type-Making, carries a frontispiece showing the Marborough Mill House, ca 1714. The text was originally included as part of the Quarterly Notebook, published by Alfred Fowler, Kansa City, 1916. Within the seventeen pages of text in this volume, Hunter explains the uses of the various tools one would need to produce type. He also addresses the various problems one may encounter. The tome does include many illustrations that support the technical discussions put forth by Hunter. However, explaining how one would accomplish the task of creating type is still quite difficult to comprehend for the neophyte. As is the case with Volume II, Volume III does not carry a colophon but it does include the same printer’s mark. Volume IV, The Specimens, is a bound book with the frontispiece once again a view of the mill with the thatched roof, yet a different view than Volume I. There is no text in this volume but only a bound set of sample papers from the mill. There are various colors of papers; some the typical buff but also some pale greens, blues, grays, rose, and a dark brown. An interesting look back, in time and ‘The Making of the Book’. The free endpaper shows the initials of FDR and ER, handwritten by ER, photo courtesy of Small Library, University of Virginia. Inside of front cover, showing the FDR bookplate, file number 1395, and a second bookplate showing the book at one time being part of the library of Robert Massmann. Miniature book collectors always seem to have a host of projects going on at the same time - it could be some research, maybe a special want search, or something as broad as attempting to identify and find the current location of the approximately 750 miniature books that were once part of the collections of Franklin D. Roosevelt. The January 2018 issue of The Microbibliophile provided an overview of the original collection and spoke about how it was dispersed over time through different auctions. The March issue provided some additional details specifically about certain books that are in the Roosevelt Campobello Island facility. There is always a lot of information in a lot of different places with a project of this size. Things can be a bit slow-going for a time and then a great piece of information surfaces (sort of like panning for gold in an Alaskan river). A few bookplates and handwritten notes and deciphered codes in books are a very useful source of information for sure. Let me roll the story ahead and say why our readers are such an asset. Caroline Brandt is one of the most meticulous readers of The Microbibliophile. I am always sure that if there is an open question about a book or something related to the world of miniature books, Caroline will be available to help discern the answer. In the January 2018 issue, I wrote about a book with an unusual bookplate/label notations and the hand-printed initials of FDR and ER. Caroline told me she had a book with similar notations as part of her collection, now housed at the Small Library, in Charlottesville, VA. Caroline suggested that I contact Molly Schwartzburg, who is the curator for Caroline’s collection at the library. The title of the book is Life and Services of Gen. Pierce: Respectively Dedicated to Gen’l Lewis Cass. Bob King Jr. published the book in Philadelphia in 1852. It is held in the Specials Collections Library and documented with the call number Lindemann 07543. Molly provided the following photographs of the book. Clearly visible is the original bookplate on the inside of the front cover indicating that it was part of the FDR collection. In addition, present on the front free endpaper is the initials "FDR ER," which from our research has determined is a notation that Eleanor Roosevelt added to the book to document its provenance prior to auction. We learned this from a small note that was printed in the 1964 Auction Catalogue from the Hammer Galleries in NYC. So, the search for the gold nuggets continues, sometimes at a fast pace of a flooded spring river and sometimes at a slower trickle of a late summer stream. However, some collectors are happy to collect titles and others are struck with a quest for more and more information. Sometimes the gathered information may be useful and interesting for many or even just a few and sometimes we define the situation as "bibliomania." In our last issue of The Microbibliophile, I reprinted an article originally written by Msgr. Francis Weber about the Warburton Archive. As a bit of a refresher, the "archive was a trunk full of miniature books and related ephemera that made its way to the shop of Louis Bondy, many years ago. They were sold to ‘who knows’ but the Msgr. being a man always looking for a story or the unusual was able to purchase the ephemera items, mostly letters from and to the likes of James Henderson and Wilber Macey Stone, Achilles J. St. Onge, and Thomas Warburton, a bookdealer of significant position in England." Msgr. 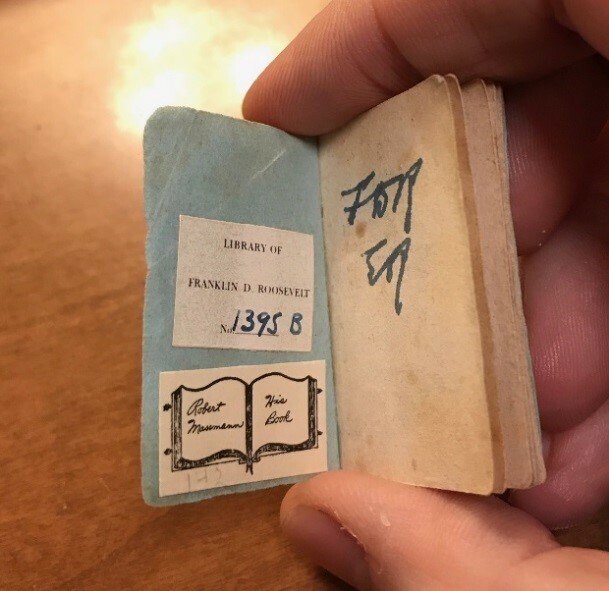 Weber did mention in his article that the letters that he did purchase went to the Huntington Library with his collection of miniature books in the 1990s. Myself not being one to wait another 20-30 years to unravel the mystery of what information was talked about in these letters, I contacted the director of the Huntington about the Warburton Archive materials. The director knew of the materials and said that they had not been digitized but he would investigate just what it would take to make the information available short of an onsite visit. A few days passed and I had the answers. The library could digitize the letters for a "per page fee." My response was "To whom do I give the credit card number?" Well, I now have all of the information, some 180 pages of data, that I am in the process of reviewing and will share with the readers as I can lace things together. I can say that most of the correspondence talks about the day to day things of book collecting. Funds available for new purchases, new books being published, and the fact that one of these famous "pioneers of the miniature book world" was having his wife sew up his pants. The depths of the 1929 depression gripped the world, money was scarce and "they had to make due with what they had." How universal life is over time. I will share the following document, written by Mr. James Henderson, of the "LXIVMOS" fame to Mr. Thomas Warburton, inviting him to join the select group of "LXIVMOS" subscribers. As time and pages permit, I will share more of these glimpses into the past days of the world of miniature books. Over the last several months (Issue 191 and Issue 192) I have written a few short articles about the miniature books published by the Kingsport Press. As you know there are three very small miniatures, published; Lincoln, 1929, Coolidge, 1930, and Washington, 1932. Preceding these three volumes was another miniature, Lincoln’s Gettysburg Address’, 1928, that has evaded the sights of collectors for some time, if not forever. Sometimes these searches go down many roads and make many turns in looking for the answer. The search goes on and I will continue looking for a copy of the 1928 publication. The most informative information actually came from the Miniature Book News article where the editor included the text of a letter written by the President of Kingsport Press in 1956 (Walter F.. Smith) to Percy S. Spielman outlining the thoughts and production processes behind the creation of the little miniatures. The text briefly explains the thought process initiated as an idea from a student in the Kingsport Press Vocational School to produce a miniature book to highlight the quality of their workmanship and the actual production processes. It goes on to explain that the book won the coveted First Prize at the EBOA convention and received a lot of press in various contemporary trade journals. Does that mean exactly what was said, they were all sent to other trade companies and more than likely lost forever or maybe somehow a few copies survived in a memento case of a retired employee? Who knows? I will continue the search. Remember that Kingsport Press was a very large printing company and they were obsessed with building the best quality into their products, which were book, books, and more books. Here lies some of the confusion and mystery between the 1928 book and the 1929 book. The contest winner was submitted to the 1928 convention and won the prize in 1928; we know that from the Proceeds of the Convention book. The preface of the 1929 book leads the reader to understand that it (the 1929 book) won the award. Could the plates for the 1929 book been used for the 1928 book as well? Who knows? That is another question, or maybe the text from the 1928 preface could have been used to create the preface for the 1929 book? The colophon of E.B.A. version of the 1929 book does mention the prizewinner as the "initial version." An additional piece of investigative content was supplied by Julian Edison, the reference he discovered on an older ‘bookseller’s catalogue’, ‘Goodspeeds’ (Boston, MA, dated August 1978). Fine copy: A special edition of one hundred and fifty copies of this book [Lincoln 1929] has been printed and bound by the students of the Training Division of the Kingsport Press for the LXIVMOS.’ Originally published in the preceding year (1928) "to be sent to the annual convention of the Employing (sic) Bookbinders of America, meeting in Boston in October 1928 (where it won First Prize)." More mention of the 1928 edition but no visual confirmation of the actual book just yet. How about your thoughts, concerns,and additional information at your convenience please. Maybe we need a bigger flashlight for this treasure chest? Along the above "roads traveled," as always; one-thing leads to another, a fellow collector called several weeks ago to put me onto the track of ‘something special for sale’ about Kingsport Press. As I mentioned they (Kingsport Press) were always interested in quality and showing that they could deliver the best products for the money. The picture below is of a "salesman’s sample" which visually outlines the various steps involved in the production of the Lincoln, 1929 miniature. The "sample" outlines all of the steps required to actually produce the miniature. This was certainly a labor-intensive process and it involved drawing on the production wizards that Kingsport employed to create the process, build miniature machinery to do the work, and actually produce the books. More than likely,these highly skilled employees were all graduates of the vocational school that Kingsport created as part of the printing company. If you study the history of the company, they moved to Kingsport because of the availability of raw materials for the business. There was a large available pool of people available to work in the plant but for the most part, they had to be taught the printing trade from the bottom up, hence the need for the vocational school and from there came the student with the idea for the miniatures. The "sample" is 9" x 113/8" and was original contained within a shallow 1/2”-thick cardboard presentation box with a removable lid. The green background paper for the actual sample and the presentation box is identical. The details of the sample board and the production process are outlined in the attached picture. The top of the sample contains an actual printed sheet 101/4" x 51/2" printed both sides and folded containing all 160 "uncut" pages of the text for the actual miniature book. On the left side are the ten printed ‘sections’ folded and cut but not trimmed that will make up the book. On the right side below the large sheet is a sewn book with the 10 sections, the next item is a trimmed book, and then the trimmed book with spine ribbon attached, ready to be attached to the cover. Across the bottom edge is first an actual leather cover, cut and stamped, ready for attachment to the book case. In the center of row is an actual completed book, next to a postage stamp to give a representation of the actual size of the finished book. Further to the left is another actual completed book, open to show the actual printed pages and the margin registrations as well as the gutters. The text labeling on the sample card would clearly indicate that the intention of the item is to show the quality and level of work that the press was capable of producing. As I uncover more information about this miniature set, I will bring it to you in subsequent issues of The Microbibliophile as well as a reprint of the actual production processes outlined by the Kingsport President Palmer. Remember, "the fun is in the chase."